40 percent of required coursework for a degree must be complete by the end of the second year, 60 percent by the end of the third year and 80 percent by the end of their fourth year. Student-athletes are allowed five years of eligibility and athletically related financial aid. 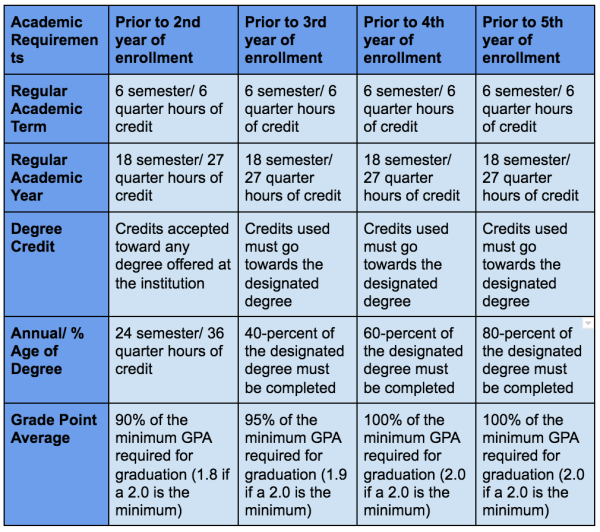 All Division I student-athletes must earn at least six credit hours each term to be eligible for the following term and must meet minimum grade-point average requirements related to the school’s GPA standards for graduation. 24 hours of degree credit must be completed each academic year to remain eligible. At least 18 of those hours must be earned between the start of fall classes and spring commencement, and up to six hours can be earned in the summer. All Division II student-athletes must earn at least six credit hours each full-time term to be eligible for the following term. 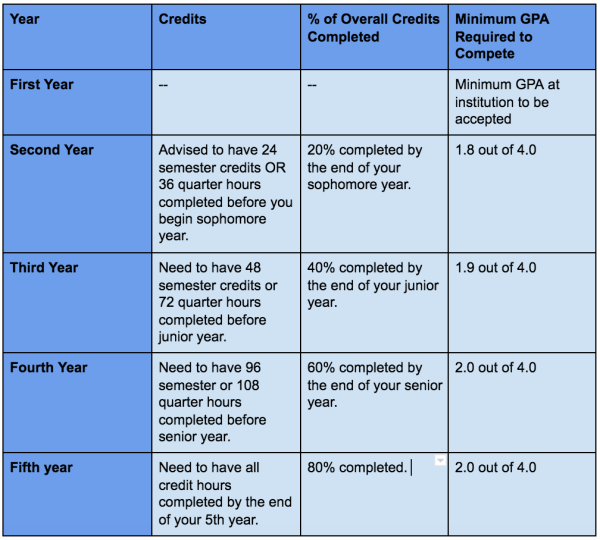 Student-athletes must earn a 1.8 cumulative grade-point average after earning 24 hours, a 1.9 cumulative grade-point average after earning 48 hours and a 2.0 cumulative grade-point average after earning 72 hours to remain eligible. Division II student-athletes must complete their four seasons of competition within the first 10 semesters or 15 quarters of full-time enrollment. ​You only have 5 years to complete 4 years of eligiblity. The percentages of overall credit completion in the chart to the left are the bare minimum to stay eligible to compete. All Division II student-athletes must earn at least six credit hours each full-time term to be eligible for the following term. Division II student-athletes must complete their four seasons of competition within the first 10 semesters or 15 quarters of full-time enrollment. While there are no minimum national standards for establishing or maintaining eligibility in Division III, student-athletes must be in "good academic standing" and make satisfactory progress toward a degree as determined by the institution. Division III student-athletes must be enrolled in at least 12 semester or quarter hours, regardless of an institution’s own definition of “full time”. Waivers are available for many of these rules, including progress-toward-degree standards. Progress Toward Degree requirements are mandatory for all DI athletes as they begin freshman year of college. These are designed to help you reach graduation on time. DII athletes are sometimes required to follow Progress Toward Degree Requirements, and typically DII athletes are not required to do so. There are standards within the requirements that students have to meet in order to remain eligible to play. Students who do not complete these requirements lose their eligibility, so stay on top of it! If you become ineligible to compete, a Progress Toward Degree Waiver may be filed to possibly regain eligibility - this goes for DI, DII and DIII athletes.